I stayed home from school the day John Lennon was shot in December 1980. I was 11 years old and probably more idealistic— and at times, I think, smarter—than I am now. This Christmas I heard “Happy Christmas (War Is Over)” while I was playing with my three-year old daughter and those words hit me harder than ever before. Maybe it’s because we have been waging never ending war. Maybe it’s because I now have two children and value life and the prospects of their future even more than ever. Or maybe it’s because I suddenly realized how I am letting my idealism slip away. I used to be uncompromising in the face of what I deemed was cruelty and injustice. Now, I make excuses. I roll my eyes at politicians who call for pulling all troops out of Iraq. I crate a web of justifications for not making more green choices in my life (too expensive, too difficult). Am I growing older and wiser, seeing the complications, contradictions, ambiguity, and impossibility of things? Or am I being lazy. Great change can’t come from apathy and self-service. No more excuses. Yeah, I know how the world works, I know. What I love about the Lennon song is that it makes change, hope, peace possible—a choice. 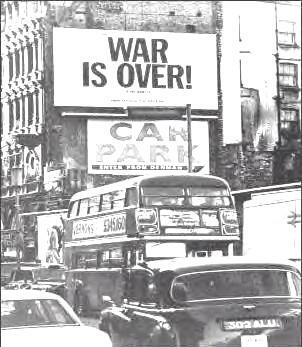 War is over. If you want it. One can imagine the citizens of 1918 Europe truly believing that World War One was the “war to end all wars” and since then… well, history tells a much different story. I believe it’s a LOT of work to dedicate oneself to seeing one’s link in the chain of things and making a change, however subtle, to alter the individual’s role. Going green is one part for sure but also internalizing non-violence is another. I hope I’m able to do as much as I can to minimize my personal impact too, but the best answer I have is: the fact you’re thinking about it and putting some of thoughts into actions puts you ahead of the curve.